Economy options for HB:ST? Yes please! If the runner ignores the card completely and plays like he would normally against HB:ST, this card can quickly pay a lot of credits back. If the runner tries to play around it and run without many clicks on unrezzed ice, then the downside of bioroids is less applicable, and the upside of ST shines through. If you trash it, then its like a pad campaign (except you don't pay to rez this card, like you do pad). And that card is good enough for quite a few decks. Another brilliant card to start of a new cycle. 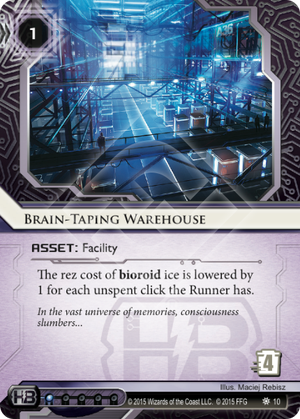 This card might seriously make me dust off Haas-Bioroid: Stronger Together and toss in a few Heinlein Grid. Forcing the runner into a catch-22 of clicks is a great feeling. Do they run on their first click and give me a free Eli 1.0 and possibly trigger Heinlein to get past (losing them money), or do they run on their last click and pay the price of running into Ichi 1.0 without any "safety" clicks? Bioroid + Warehose + Executive Boot Camp = at the beginning of your turn rez bioroid for -5 credits which makes half of them free to rez at a total trash cost of 7.